Welcome to MyBinding Video. 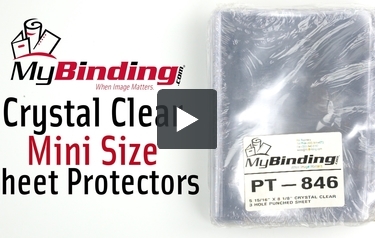 These are the Crystal Clear Mini Size Sheet Protectors from MyBinding. Heavy duty vinyl protectors ensure your documents last the test of time. These protectors are made with ultra clear, 6 gauge vinyl, they’re welded with precision and reinforced on the 3-hole binding edge. They can hold several sheets of 5.5x8.5” paper and they won’t stain or stick to the protector. These protectors are available in packs of 100. For more videos and all your binding needs, visit MyBinding.com. Thank you for your question. The 5-5/16" x 8-1/8" Crystal Clear 3-Hole Punched Sheet Protectors come in packs of 100.